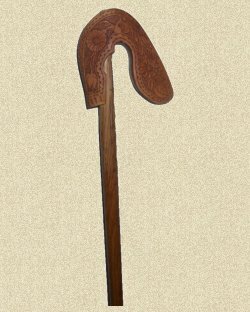 The Greek walking stick "glitsa"
Lost in the ancient years is the history of glitsa, the walking cane or stick that Greeks shepherds usually use. My collection is going to get growth every month with genuine and unique glitsas, that I personally craft and make from nice wood pieces or tree branchs or roots. Most of my glitses are hand-crafted on special woods that Greeks used to use many years now. The comfort, the physical stability and security in conjunction with unique and handmade glitses it’s a very good reason for any cane enthusiast to stand and have a look at my walking sticks. My name is Nikos Anastoulis and I'm making glitses for the last 20 years. This isnt a job for me its mostly a hobby and its something that I enjoy and be glad to do. I hope that you can see that on my glitsa. All of the canes on our site are almost always in stock. Because of the uniqueness of each one, after a glitsa is sold then I cant sell another same one. You can order your new walking cane - glitsa from our safe and secure online checkout.